When it comes to last year’s disappointing Batman v Superman: Dawn of Justice, most fans agree that Wonder Woman stole the show. Some might even go a step further and say that the Amazon princess was the only thing about the movie that was worth watching, and audiences were left waiting with bated breath for Wonder Woman to get her own movie. Well, the wait is over; Wonder Woman is here. For the most part, Wonder Woman is an origin story, beginning with Diana Prince (Gal Gadot from the Fast & Furious movies) growing up and learning to fight with a group of Amazon warriors on a majestic island paradise. The first man she ever sees is Steve Trevor (Chris Pine from the Star Trek reboots), an American WWI spy whom she plucks from the sea when his plane is shot down by the Germans. When Steve tells Diana about the war, she determines that it is her destiny to confront and kill Ares, the God of War, in order to stop the fighting. Steve, on the other hand, has uncovered a formula for a deadly German nerve gas about which he must warn the Allies. Diana and Steve leave the island and travel to the front lines, both with different ideas on how to end the war. Wonder Woman was directed by Patty Jenkins (Monster) from a screenplay written by Allan Heinberg (“Party of Five,” “Grey’s Anatomy”). In many ways, it’s a typical superhero origin story, essentially detailing the early life and times of Wonder Woman before she realized her full powers or her true calling in life (or even before she was called Wonder Woman – she’s referred to as “Diana” throughout the film). Like any good superhero movie, it’s more action than talk. In fact, the lulls in action – the forced love story between Diana and Steve, the moral compass installed in her by her mother, Hippolyta (One Hour Photo‘s Connie Nielsen) – are where Wonder Woman starts to drag its feet. Thankfully, there aren’t many of them; most of the time, Wonder Woman is faster than a speeding bullet and more powerful than a locomotive (oops, wrong superhero!). For her part, Gal Gadot is an awesome Wonder Woman. Although comparisons are inevitable, Gadot doesn’t even try to compete with the old Lynda Carter standard. Instead, Gadot takes ownership of the character and creates something new while still staying true to the comic book roots. 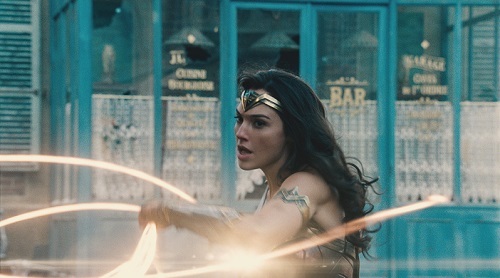 Gadot makes the most of her character’s limited development (which is more than can be said for Chris Pine), so even with the gaps in her backstory, she is still charismatic and commanding enough to carry the movie, becoming the type of hero for which audiences love to root (which is also why she was the most magnetic presence in a movie that was supposed to be about Batman and Superman). The big fault with Wonder Woman is, unfortunately, the same pitfall with which seemingly every other superhero movie grapples – the climactic battle rages on for about a half hour too long. 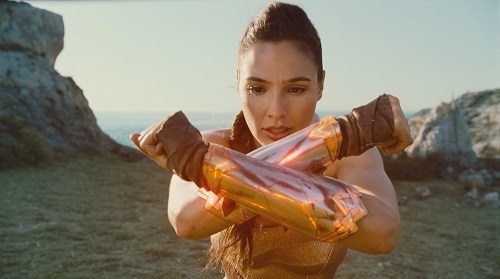 Sure, no one wants the final boss fight to be a one-punch knockout, but there are at least three places where Wonder Woman could have gracefully ended if it weren’t for the unspoken need for all superhero movies to run close to the two-and-a-half hour mark. But hey, if the biggest problem with a movie is that it has too much knock-down, drag-out fighting, more power to it. Especially when the movie falters every time that fighting lets up. The word on the street is that Wonder Woman is going to save the DC Comics cinematic universe. That may be an exaggeration, but one thing is for sure; Wonder Woman is way better than both Batman v Superman: Dawn of Justice and Suicide Squad. Heck, it may be the best DC movie since Christopher Reeve donned the tights in 1978’s Superman. It’s definitely the best since The Dark Knight Rises. Between this movie and the undeniable charisma that Jason Momoa’s Aquaman showed off in the trailer for Justice League, there are reasons for DC fans to get psyched up. 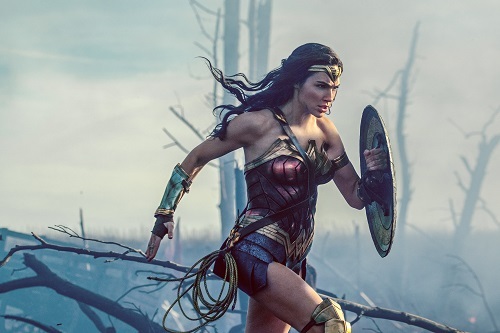 An ambitious epic like Wonder Woman needs equally ambitious music, and the score for Wonder Woman, composed by Rupert Gregson-Williams (Hacksaw Ridge, The Legend of Tarzan), fits the bill nicely. The soundtrack is a cool combination of big orchestral pieces and slamming rock percussion-and-guitars, always loud and grand in a stand-up-and-cheer kind of way. It sounds like what you’d get if a score by Alexandre Desplat hooked up with one of Hans Zimmer’s works and had a baby that was raised by Queen. The only regrettable thing about the music is that it doesn’t ever break into the bitchin’ seventies funk theme from the classic “Wonder Woman” television show. Not even once. But that probably was asking a bit much. Even without the retro-kitsch, the score for Wonder Woman is pretty cool. Wonder Woman may not be bell-to-buzzer action scenes, but it is close. The action only stops for calm little moments of plot-defining exposition between raging battles. And Diana is at the center of it always, from her training on her Amazon home island to her almost single-handedly taking on the German front in France. The differing locations and fighting styles allow the action in the film to cross genres, going from a sword-and-sandal adventure to a full-on war epic, all while hanging out under the umbrella of a superhero movie. The action sequences have plenty of that slow motion/freeze frame The Matrix-type of thing, which is actually functional instead of gimmicky; it allows the audience to see the fast barrage of bullets that Diana deflects with her wristbands and shield while illustrating how she sees the world through her superhuman Amazonian eyes. In a nutshell, Wonder Woman delivers all of the adrenaline and excitement that a summer blockbuster should.